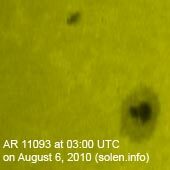 Last major update issued on August 6, 2010 at 05:15 UTC. 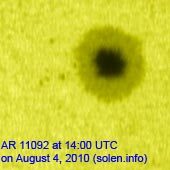 The geomagnetic field was quiet to active on August 5. 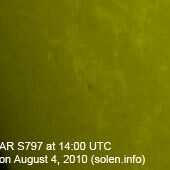 Solar wind speed ranged between 447 and 504 km/s. 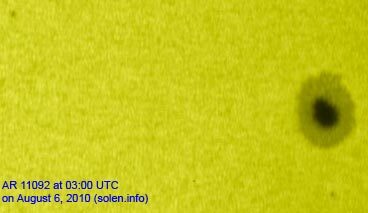 Solar flux measured at 20h UTC on 2.8 GHz was 82.7. The planetary A index was 10 (STAR Ap - based on the mean of three hour interval ap indices: 9.6). Three hour interval K indices: 43011222 (planetary), 44111212 (Boulder). Region 11092 lost the small spots from the previous day. However, two new small spots emerged, one of them distant from the leader spot. The other small spot is a little problematic. Although it appears to be part of region 11092 and is located due south of the leader spot, it could also be part of an emerging reversed polarity region as indicated by magnetograms. Region 11093 decayed slowly and simplified magnetically. Further C flares are possible. 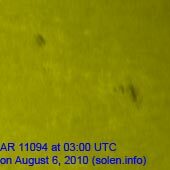 Flare: long duration C1.3 event peaking at 21:35 UTC. 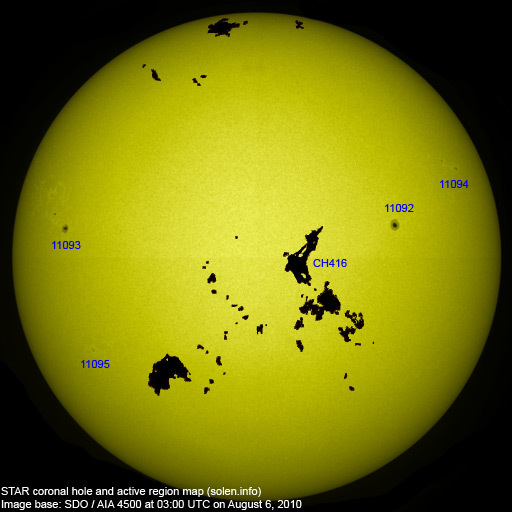 New region 11094 emerged in the northwest quadrant. 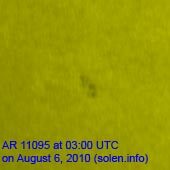 Actually a spot was observed in this region already on August 2 but disappeared the next day. 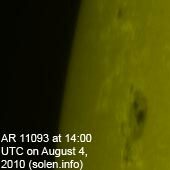 New region 11095 rotated into view at the southeast limb on August 4 and was numbered the next day by NOAA/SWPC. All spots have the same polarity. August 3-5: No obviously Earth directed CMEs were seen in LASCO or STEREO images. 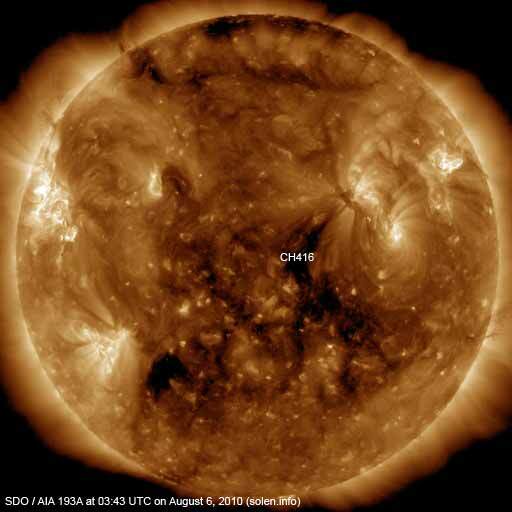 The geomagnetic field is expected to be quiet to unsettled on August 6-9, on August 8-9 due to effects from CH416.